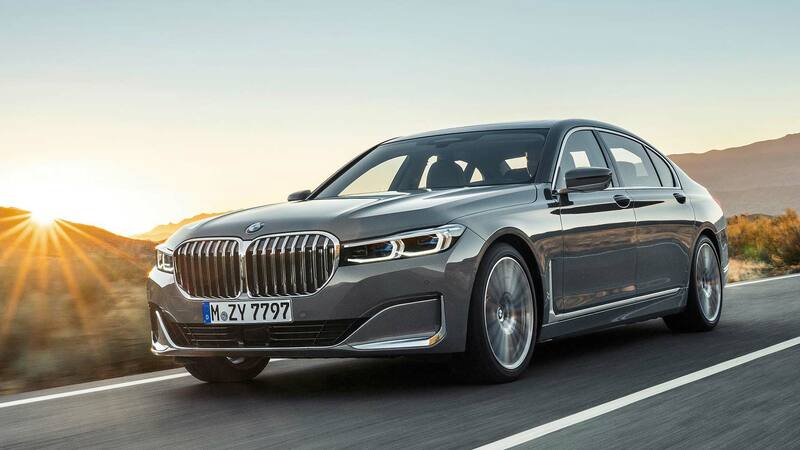 BMW has revealed the facelifted 2019 7 Series and you’re going to have no trouble picking it out from the outgoing model thanks to its massive new kidney grille. 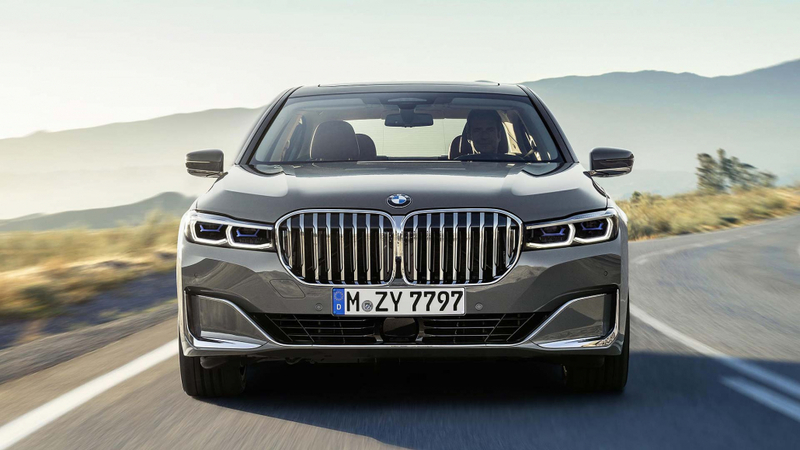 Continuing the theme of the BMW X7 and new X5, this is a facelift in the most literal sense (the height of the front end is up 50mm to accommodate the grille), although the surgeon carrying out the work appears not to have the subtlest of techniques. 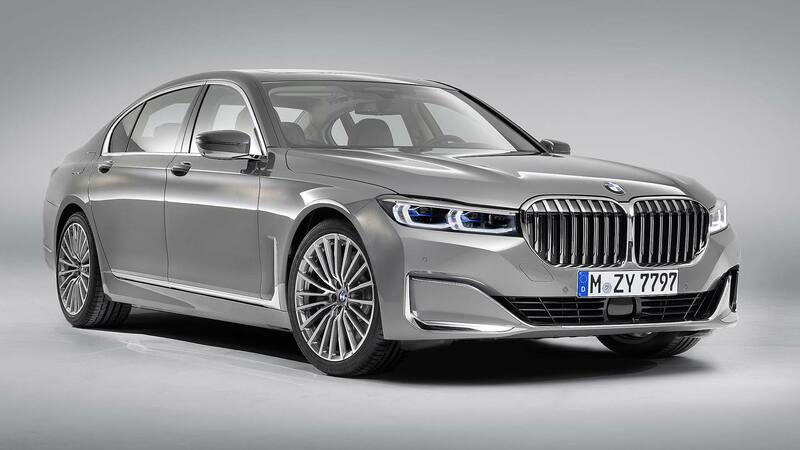 BMW says it gives the new 7 Series a “confident presence” and makes a “clear statement of intent”. Quite; it’s also calculated the kidney grille has a 40 per cent greater surface area, making it a “dominant force” that contrasts with headlights that are actually slimmer. The BMW roundel is bigger too, and the new bonnet has sharper contours. New bumpers front and rear give a sleeker look, and the rear lamps are 35mm slimmer than the old car. BMW’s particularly proud of the slim light bar that runs beneath the chrome strip on the boot; it’s just 6mm wide. Inside, it’s become more luxurious and sumptuous. Quilted Nappa leather is now available, and new trim insert strips include American Oak Dark and Poplar Grain Metallic. A new steering wheel has modified, more straightforward multifunction buttons. The new 7 is quieter as well; the side glass and rear window are thicker, and BMW has revised the rear wheelarches, B-pillars and seatbelt outlet covers to cut noise levels. Perfect for letting those in the rear enjoy the optional new touchscreen HD displays. Engines are all-new (and all WLTP Euro 6d-TEMP-compliant). The irrelevant range-topper remains the 6.6-litre V12 M760Li xDrive, which offers 585hp to the handful of people who will buy it. BMW has also boosted the 4.4-litre V8 in the 750Li xDrive by a substantial 80hp up to 530hp. But the best-sellers will have fewer cylinders. 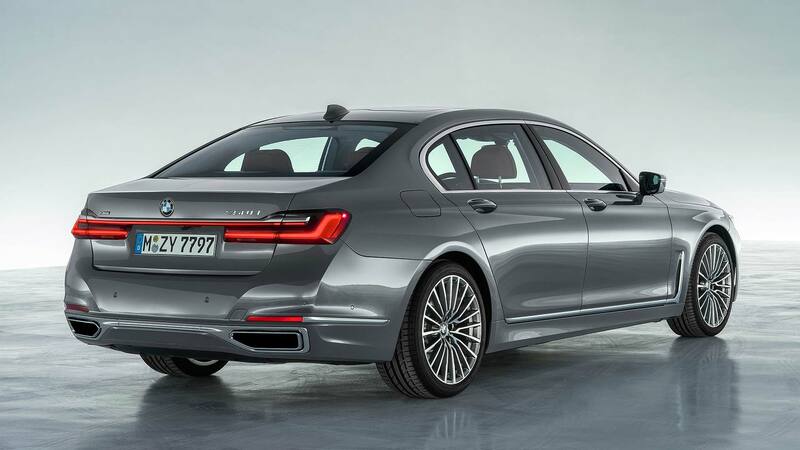 Expected to be popular is the revised plug-in hybrid 7 Series, the 745e, 745Le and 745Le xDrive. A six-cylinder engine is now fitted, paired with a more powerful high-voltage battery, giving 394hp and CO2 emissions as low as 49g/km. The realistic all-electric driving range is between 31 and 36 miles, says BMW. The key car will likely remain the 730d diesel though; it produces 265hp, emits as little as 138g/km and will do up to 53.3mpg. 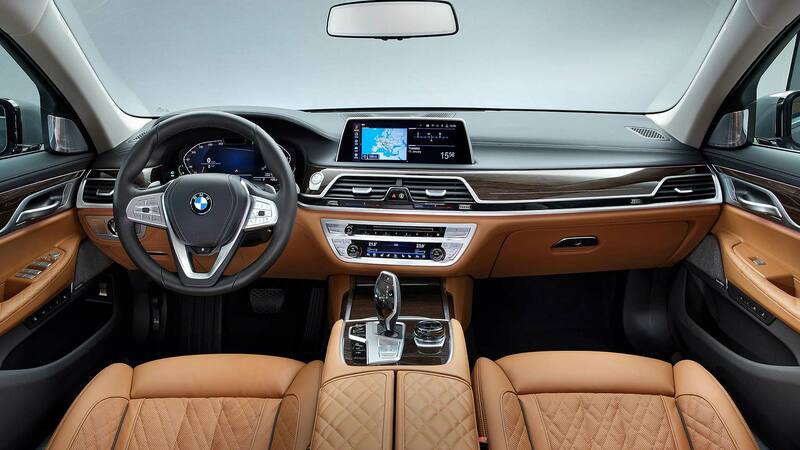 Other upgrades include the new BMW Operating System 7.0 for onboard infotainment, an upgraded digital instrument cluster and Control Display, and a clever new Reversing Assistant that takes the pain out of parking a car that, in long-wheelbase guise, stretches 5,260mm. We look forward to finding out more about how BMW has improved a former World Luxury Car of the Year winner, and how much it will charge. For now, though, it’s all eyes on the enlarged grille… let us know what you make of it in the comments below.